The Paul A. Barker Park site was donated to the Springfield Park District by the Paul Barker Trust in 2005. This 26-acre site is adjacent to Franklin Park Estates neighborhood that was developed during the 1970s and 1980s. The University of Illinois is to the south and its campus was developed during the same era. The District selected park planners Massie Massie & Associates (MMA) to develop a Master Plan to convert this agricultural field site into Paul A. Barker Park. Development of the Master Plan involved careful analysis of the existing site conditions, discussions with staff of the Park District and the University of Illinois at Springfield, and meetings with neighborhood residents and special interest groups. The Park District’s 2005 Updated Master Plan and City of Springfield’s plans were also incorporated. MMA developed and presented alternative conceptual plans at various meetings. These were revised and refined as planning progressed to ultimately produce the final plan. 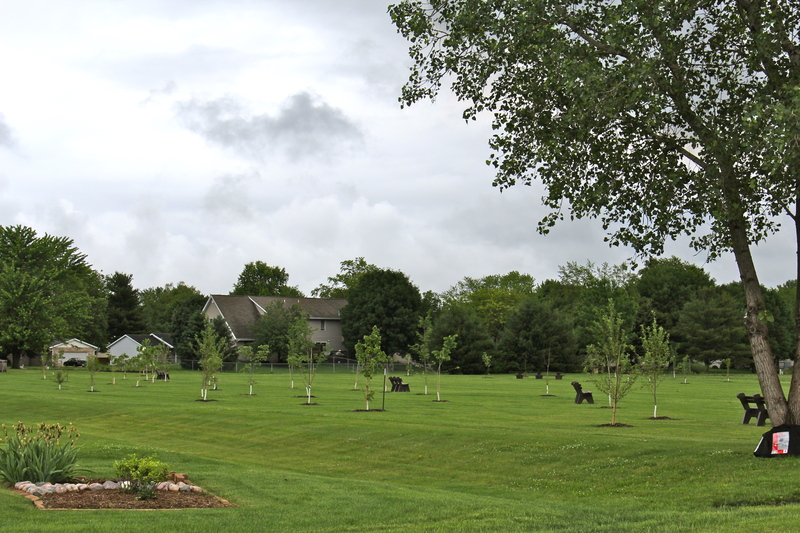 Many components in the first phase of this proposed park were completed in May of 2015 and includes an entrance to the park, with a gravel parking lot for 6 vehicles, Paul A. Barker Park signage, a picnic shelter with tables, benches, tons of trees that were planted and 6 acres of green space for residents to enjoy. Paul A. Barker Park has been in the planning phase for several years and with a strong partnership between the Franklin Park Neighborhood Association and the Springfield Park District. The implementation of the first phase of construction will surely be a marvelous recreational space for families living inside Franklin Park Estates as well as for the Springfield Community. A dog park was included in a recent request from the Neighborhood Association and future plans for the development continue to be discussed. Watch for this park to grow!